I have been self-employed since 1980. 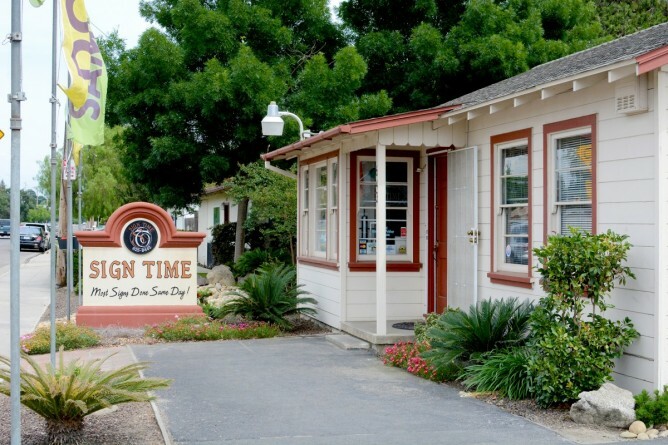 We opened Sign Time in 1993 where my love of graphic design and sign making quickly became one of my greatest pleasures in life. I have been blessed to have a “job” where I could come and “play” all day! In 2018 I decided to semi retire and move to our coastal home full time. Danny is doing a wonderful job managing the shop for me and I stay in contact with him via phone and email. I am able to sneak in a few sign orders from contacts here at the coast and get the chance to do a little design work from home. My husband, Rick and I have been married for 45 years and have two children and three grandchildren. My hobbies are playing with my grandchildren and flying. My husband has been a pilot for many years and I just received my private pilot’s license in 2008. We often fly to Visalia to check on the shop and also to Palo Alto to see our grandchildren. Life is good! I've been in the print industry for over 19 years, with 14 of those years as a graphic design/print shop manager. I'm very pleased to be part of the Sign Time family and look forward to spending many years together. If I'm not at the shop, you'll find me spending time with my lovely wife Christine and our two boys, Aiden & Owen either hiking in the Sequoias, camping with our Cub Scout troop, or working on our little backyard garden. Other hobbies include playing guitar, photography, painting and a variety of diy wood crafting projects. I'm currently the production manager here at Sign Time, overseeing all signage assembly and installations. I'm also a full-time college student majoring in Engineering. I'm married to my beautiful wife and ex-coworker Tara. We enjoy teaching and playing with our two sons, Brandon and Colton. The quickest way to my heart is through food. I LOVE eating. My work ethic is a thousand times better than my bio writing skills. I was born and raised in Tulare, CA. I went to school to learn computer graphics and design in Monrovia, CA. Since then I have held several jobs as a graphic and web designer. At Sign Time, I am happy to have the chance to use my talents from day to day. In my spare time I play electric blues guitar. I love Sci-Fi shows and movies. Sometimes I'll fire up some old NES games just for fun! I was born and raised in Visalia and I am the bookkeeper here at Sign Time. I moved over to Sign Time from the health insurance industry and I am currently enjoying my position here with my co-workers. When I am not working, I enjoy spending the majority of my free time with my son. I love to spend time outdoors with my son, either at the park, in the mountains, or going on walks together. My favorite hobbies are definitely cooking and running. I look forward to cooking dinner when I get home every night. I am originally from Central New York. I went to college for New Media Design/Graphic Design. I previously worked as a digital photo retoucher and have experience in event planning as well. My hobbies include baking, crafting, yoga and spending time with my pets. I have really enjoyed my time at Sign Time so far and look forward to my career here!